We are your Bathroom Renovation specialists, turning your dream bathroom into reality. 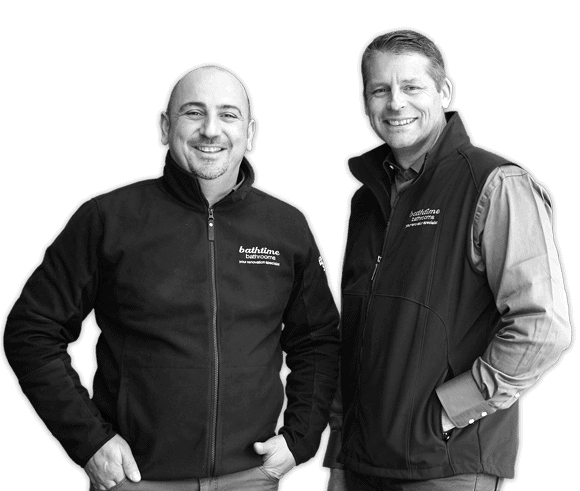 After working together for over 18 years perfecting the art of bathroom renovations, Tony and Wayne combined their skills and expertise to form Bathtime. Bathtime is a complete bathroom design and renovation specialist. From design advice, product selection, project management and renovations, we work with you to design and build a space you and your family will love. Bathtime Bathrooms has specialized for years in bathroom renovations, bathroom remodeling and bathroom design. We now offer the same quality service in Kitchen Renovation and Laundry Renovation. If you need help to realize your renovation dream, we can help you with design and construction according to your needs and your budget. Bathtime Bathrooms renovated our ensuite, we were extremely pleased with the service that we received. It is refreshing to deal with a company that is so professional, punctual, and with years of experience behind them. All the tradies are lovely friendly guys, they went to great effort to make sure any mess and dust was kept to a minimum, not only in the space they were working but also from their vehicles and through the house. Wayne was a terrific project manager and if not onsite was only a call away. To attempt to manage all the plumbing, plastering, carpentry, electrical and tiling trades myself would of been a nightmare, it was so much easier to have Wayne there to coordinate all the different trades, I have found attempting this yourself and missing one small detail can be a very expensive fix. We are very happy with our ensuite including the underfloor heating (as suggested by Tony) which has been worth its weight in gold this cold winter. Highly recommend this company. Hi Bathtime Bathrooms. I was happy with your work and in particular your promptness, reliability and willingness to meet my requirements. I had put the renovations off for a long time as I was reluctant to go through the upheaval, mess and disruption. However my bathroom renovation was completed with minimum disruption to the rest of the house, with the stipulation time and to high standard- thanks to Tony and his team I now have a beautiful new bathroom, toilet, laundry and workshop! Thank you Tony and the all the team at Bathtime bathrooms for our new bathroom plus the tiling in our kitchen. I highly recommend bathtime bathrooms for any type of renovation works. The team and the office staff we friendly and very professionals. Thank you for your great service. Tony! The photos look amazing! We are thrilled with our new beautiful bathroom and downstairs floors and our Kitchen. Thanks to your Team, ultimate professionals and so easy to have work in our home. Ensuite not far away..... Thank you so much!!!! Simone. I'd like to thanks Tony from Bathtime Bathrooms and Chris Shield for the sensation job they did at renovating my bar. Any customers of Tony's are friends of ours so please come and receive 10% off your first drinks!The Professionals Reno boys!!! Hello to Tony, Wayne and the crew of Bathtime Bathrooms. I want to put on record how satisfied Ann and I are with the bathroom and laundry renovation you carried out recently. The whole project, from beginning to end was dealt with in a very friendly and professional manner. We are both completely satisfied with the result. Any difficulties were dealt with promptly, efficiently and with an attention to detail we came expect from the knowledgeable and professional tradespeople involved. I would not hesitate to recommend yourself and the crew to anyone contemplating bathroom/laundry renovations. Thanks again Tony for your excellent work, patience and understanding. Words cannot express enough our sincere gratitude to the Bathtime Bathrooms team, Dominic and his staff at Bourne Bathrooms and the team at Designer Tiles. Sarah's vision of her dream bathrooms were transformed from just ideas in Sarah's head into reality within the timeframe quoted and so seamlessly. Nothing was too much trouble for Tony and Wayne. The professionalism of the entire Bathtime Bathrooms crew ensured the massive task was completed with ease. Attention to the little things made the overall transformation of the bathrooms such a success. We are going to enjoy our new bathrooms for a very long time. We are very pleased with the final results of our Ensuite. We would like to commend the following tradesmen for their excellent work standards; Kieran, Rocco, Simon , James and Paul. Thank you to Tony and Wayne for bring approachable and available throughout the project. We also appreciated the recommendations for plumbing and tiling businesses as their products were top quality. Friends and relatives have enjoyed seeing the photos taken both professionally and by ourselves. Thank you again for a job well done! To the SUPERHERO TEAM that transformed our out dated overused bathrooms into glamorous retreats, THANK YOU!!! Whilst the bathroom makeovers are fantastic in their own rights, it was the wonderful personalities of the team that made the experience unforgettable. You are a great crew and have enjoyed getting to know you all. We appreciate the blood and tears that you put into the transformations. Thank you!! we wish you all the best... Thanks for everything. A BIG thank you to the team at Bathtime Bathrooms who have transformed our existing bathroom to a new, fresh usable room. Great team you have Tony- From Helene, Wayne, Paul, David, Joe and Nick. Hi Tony and Wayne, I would like to say a "BIG THANK YOU" for a job well done on my BATHROOM renovations and all tiling work in our kitchen. I would like to compliment you on your professionalism in getting the job done to our specifications. Despite a few small setbacks, you were able to deliver in the timeframe and kept us informed right through, on a daily basis. You were also adamant that a quality job was delivered and did not take any shortcuts...I thank you for this. Wayne, I admire your calmness and ability to make things work...well done. Tony, Thanks too...for stepping in and doing the varnishing etc. When Keith was hospitalised and keeping us satisfied with the job. I would like to say a special thanks to your staff, who were always keen to offer that little bit more to keep the customer happy. There were absolutely no issues with them and they create a lot of "good wil" for your company. Thanks to Ciaran, Hayden, Simon , Keith and the tiler Rocco. Thank you Bathtime Bathrooms job well done our bathroom is magnificent! Thank you to Tony and Wayne who have done an outstanding job on both our bathroom and Ensuite renovation. You have a great team working for you, who made everything run smoothly and are very efficient. We loved the photo shoot at the end and have received nothing but wonderful comments from our family and friends. We wish you all the very best. Thanks again for all your hard work and dedication. A massive Thank you to the team at Bathtime Bathrooms. You have made our existing bathroom and laundry into something we could have only dreamed of. Right from the start you never let us down, we appreciate all your time and effort that you have given us. We Could not have asked for a better job. Thanks again to everyone who made this experience an enjoyable one. We absolutely love your work and love the end result. Our friends and family are impressed with the outcome as much as we are. We will be sure to recommend you to anyone who needs renovation work, all the best. To the team at Bathtime Bathrooms, Words cannot describe how utterly impressed we are with our new bathroom. We can't thank you enough for turning our old bathroom into a calm,relaxing room that looks amazing. From Tony and Wayne right through to every tradesmen we could not have asked for more professional and friendly guys working in our family home. The whole renovation was a great experience and one we will never forget. From the big things right through to the very small things everything was most important to you and nothing was too much trouble. Thank you again for your efforts!! Thank you BATHTIME for renovating our existing bathroom.. LOOKS FANTASTIC!!! Kept up the good work!! Thank Tony & Wayne and all the team at Bath time Bathrooms. Our Bathroom & Kitchen looks wonderful!! Also A BIG THANKS to Helene in the office. Michelle. We enlisted Bathtime Bathrooms to fully renovate our family bathroom, ensuite, laundry and two powder rooms. We were after a pretty good quality of finish and right from the word go, Tony and Wayne gave us the confidence that we could achieve what we wanted with the budget we'd set. The results were fantastic! Every time we walk into our wet areas we're reminded of just how good the job was. We love it! When it comes to any renovations, there are always hiccups as you don't know what's underneath before you start but any issues that were uncovered were dealt with quickly and easily. After sales follow up has also been excellent. I'm sure you could get renovations done cheaper by cutting corners, but if you want a job done properly and to a high standard, I'd absolutely recommend the team at Bathtime Bathrooms. Have worked with Tony and Wayne on a number of projects, they are committed to customer satisfaction, quality and value. Give all jobs their time and consideration - personally ensuring completion is to their standards and the customers expectation. Always the bathroom renovation team I recommend to my family, friends and clients. Tony & Wayne provide an excellent service backed up by a friendly, professional, prompt and polite team of trades. Trades were on-time and took care to look after our home while the bathroom, toilet and laundry underwent their transformations. At end of each work day, rubbish was disposed of and the house was left in a tidy condition. Wayne kept us updated with progress by calls, text and e-mails as needed. The renovations looks great and we are more than happy with the works undertaken. The only delay was caused by outside factors, so ensure that all your fixtures, fittings & cabinetry is onsite before works start, because as we experienced, an unexpected delay (despite promises to the contrary) from a supplier can throw the whole schedule out the window. Compliments to both Wayne and Tony for persevering and bringing the project to a successful completion. Tony at the team Bath time bathrooms tiled our outside patio. and the service was Excellent!! Tiling work looks awesome and Thank you again for a job well done! Steve. Living in an inner city apartment, my renovation came with location, access and demolition challenges that most tradies just won’t take on. But Bathtime Bathrooms came to the party. Whilst mess wasn’t a factor (I was living off-site during the reno), trust and communication was key and throughout the project, Wayne ensured I was fully informed as to what trades were in my home and how things were progressing. Despite me changing some design elements at the last minute (which were accommodated with no fuss), the project was delivered within three days of the estimated time frame. Thank you to Tony and Wayne for coordinating it all…and to your team on the ground - Adam, Mick and Jimmy whose can-do attitudes and attention to detail saw my design ideas realised to an exacting standard. Is it possible to love a bathroom? I think I might! It was a pleasure to have my bathroom renovation carried out by Bathtime Bathrooms. Each tradesperson arrived on time and they were all respectful towards me and my property. The project involved matching up heritage features and infinite care and research was undertaken, resulting in a flawless result. I would certainly use this firm again and would not hesitate to recommend them. We are committed to using only highly skilled tradespeople in their trade while offering a unique experience throughout the transformation. Customer satisfaction is our ultimate goal.